When I said "Watch the steps!" I didn't mean it literally. Fool! The table on the right looks like a WWE WRESTLING table !!!! "I'd better do something with this step. Yeah... it smells like its rotten"
Not a fail, he's just planking. No Timmy, that's not how you go up stairs. 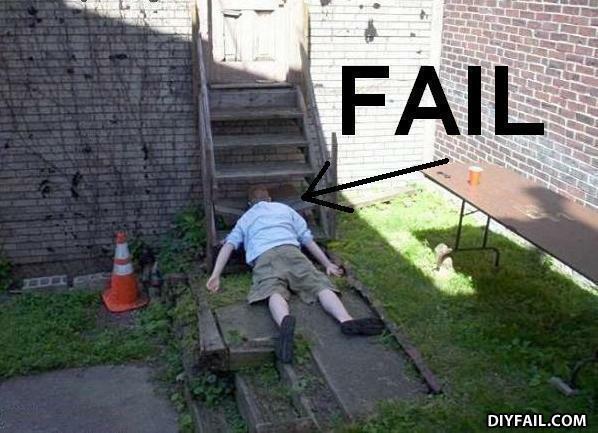 he broke the stairs lol. now this is what i call... "FACESTAIRS!!!" He looks like he either jumped out the window or roof. Or, pushed.